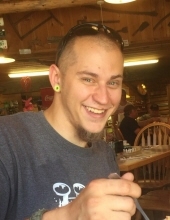 LITTLETON – Zachary Dylan Compher, 29, of Lafayette Ave, died during the early morning hours of January 20, 2019. Zachary was born in Worcester, MA, on June 4, 1989 the son of Keith E. Compher Sr. and Kimberly A. (Kane) Compher. He was raised in Maryland attending schools there before enlisting in the US Army. He served in the Iraq War and was later stationed 2 years in Germany, which he loved, and 2 years in Hawaii. He was a trained military diesel mechanic and his work specialized on Strykers. Returning stateside he was employed for a time at Tambe Electric in Pennsylvania, then the Tire Warehouse in Littleton and for the past 2 years with the Granite State Truck Center, Littleton. Zachary had a great sense of humor and was a big fan of Pink Floyd. He enjoyed raising tropical fish and spending time with his war buddies. His greatest enjoyment was being with his family. Zachary was a member of the Veterans of Foreign Wars. Surviving family members include his two children, Ethan Blake Licursi and Kathryn Renee Compher; his parents Keith and Kimberly of Whitefield; his fiancée Aundrea Harter of Whitefield; his maternal grandmother Diane K. Kane of Woodstock, CT; a brother Keith E. Compher Jr. of Palmer, MA and a sister Kathryn Charisse Compher of Arbutus, MD. "Email Address" would like to share the life celebration of Zachary Dylan Compher. Click on the "link" to go to share a favorite memory or leave a condolence message for the family.